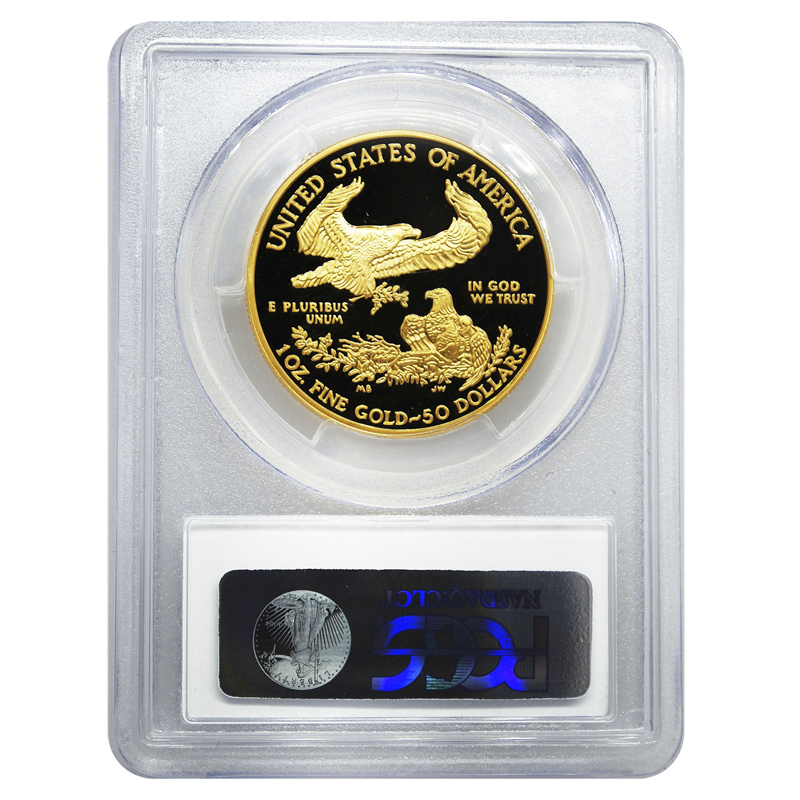 The 1 oz Proof Gold American Eagle has long been the most popular coin in the collector’s version of the national gold bullion program. While the proof version also features three fractional-weight coins, it is the 1 oz that investors and collectors often prefer. Today, the 1994-W 1 oz Proof Gold American Eagle is available from Silver.com in perfect condition. Just 242 coins currently exist in this grade and condition! Bears a face value of $50 (USD) backed by the US government. Graded a perfect proof by the Professional Coin Grading Service. “W” mint mark indicates West Point as the production facility. PCGS plastic slab protects coin’s condition. When the Proof Gold American Eagle coin was introduced in 1986, it marked a change in the production of US gold coins that hadn’t occurred in almost 150 years. The last US gold coin produced with a gold purity level above .900 had been struck in 1837. Gold American Eagle coins marked the end of the crown gold alloy standard in America. All Gold Eagles feature only gold sourced from within the US. Each of the 1994-W 1 oz Proof Gold American Eagle coins in this Silver.com listing has a PR70 grade. Perfect proof coins have their full, original luster, and no blemishes. Deep-cameo coins are characterized by design sets that appear to float above clear background fields. On the obverse side, Augustus Saint-Gaudens’ depiction of Lady Liberty. First designed in 1907, this image helped revitalized American gold coin design during its production run on the $20 Gold Double Eagle. The reverse side features a one-of-a-kind design from sculptor Miley Busiek. Her creation was developed specifically for Gold American Eagles, and shows a male bald eagle flying over the nest as a female protects the nest and its hatchlings. All Proof Gold American Eagle coins are produced by the United States Mint. While production of fractional-weight coins was originally handled by Philadelphia and San Francisco, the 1 oz coin has always been produced at West Point. Please direct any questions you have about these coins to a Silver.com associate. We’re available at 888-989-7223, online using our live chat, or via email. Looking for similar products? 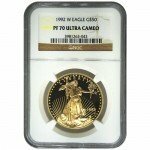 Be sure to check out our full selection of Proof Gold American Eagles.